I just got back from an awesome trip to Williamsburg with my family. Traveling and blogging didn't mix well for me, so sorry about the absence this past weekend. I can't wait to share with you about our trip. I will be doing that later this week. Be sure to come back for some great tips on Williamsburg. Now, onto today's post! As a little girl, I loved to go to Tastee Freez with my family and get a chocolate or cherry dipped ice cream cone. The hard candy shell covering my soft serve vanilla ice cream was just divine. I have never seen a cherry magic shell sold in stores, but I have found Chocolate, and Peanut Butter. 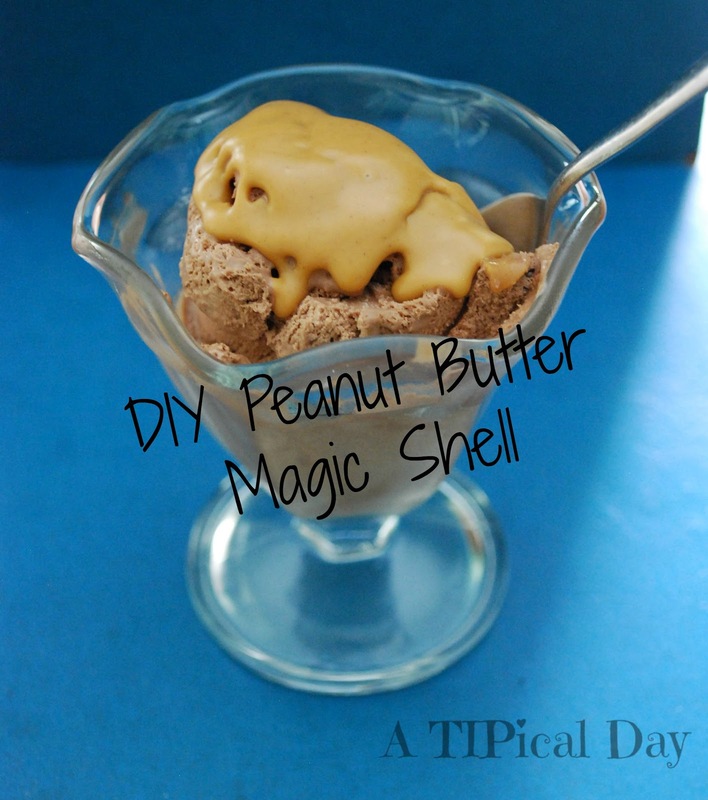 I just love the taste of the peanut butter magic shell. Since I don't usually keep those toppings in the house I often have to get creative. One night I really wanted peanut butter with my ice cream, but didn't want a big glop of it, so I melted a little down and drizzled it over my ice cream. Much to my amazement, it hardened just like the magic shell and tasted great! Place in a microwave safe dish and heat in 30 second intervals until completely melted. Stir and drizzle over ice cream. Grab a spoon and go to town! This will make enough for two dishes of ice cream maybe more depending on how thick you like it. I like it nice and thick! ***Tip - To make Chocolate Magic Shell follow directions above but use 1 cup chocolate chips mixed with 1 tsp of vegetable oil in place of peanut butter. I didn't know you could do Magic Shell yourself. I bet it's so much better for you this way. My kids LOVE it and the peanut butter would be a big hit, I think. Thanks for the share! Great trick!! I too love the hard shell type of ice cream topping. Thanks for sharing. fun!! Does it harden like magic shell? Sounds yummy!!! Great ice topping. I love the hardened shell of Magic Shell but hate the ingredient list. Creamy peanut butter is healthier and very doable in my house. Thanks for the idea. Thank you Nicky! I was amazed by the simplicity of it! It taste amazing too!